You’ve got a website, a blog, and a multitude of semi-tended social media channels. You work hard to keep them all up to date, But engagement just isn’t what you’d hoped for and maybe, like me, you’ve questioned whether creating content is the best use of your time. How do you make people care and how do you do that quickly? Visual content, that’s how! A well chosen image, illustration, or video clip is the quickest and easiest way to have an impact on your audience, boost engagement, and substantially increase retention of your content and company. In my upcoming series, Website Photography Tips for Small Budgets, I will be demystifying all things website imagery: from copyrights, to sharing where to find effective but inexpensive imagery, and how visual content will take your content from “meh” to “hmmmm” with your target audience. This is the original way all stock licensing was done. Licensing fees on RF images are based on many variables including the medium on which the licensed content will be seen (online ad, website, billboard, print brochure, etc), the length of time they will be used, the region / language (ie-California / English), and the industry that your business is in, amongst many other determining factors. RF can be complicated, you need to know exactly how you will be using the images and for how long. They are also the most expensive and can range from a few twenties to tens of thousands. For small business people on a budget, it’s usually a good idea to avoid this type of licensing format. Cameras have gotten increasingly better, cheaper, and easier to use over the last 10+ years. This has resulted in a vast amount of high quality images available to the world. This influx naturally forced stock companies who’d long held to the expensive Rights Managed licensing formats, to devise new options for their customers. Thus, “Royalty Free” licensing was born–and you can be the beneficiary! RF is straightforward and usually very cheap. The only bit of info that you might need to bring to the table you is how large you’d like the image to be (e.g.-1920×1080 pixels) and sizing is usually the only variable that affects the price. Once you’ve found an image you’d like on an RF website, pricing is listed right next to each image, are one-time, flat fees, and allow use of the image in just about any way you’d like and for as long as you’d like. Simple as that! GettyImages.com – One of the oldest and by far the largest stock companies but still expensive. Getty licenses both RM and RF images so be sure to check the “RF” checkbox before you click the search button. Clicking the first RF image that came up in a test search showed that licensing starts at $50 and quickly goes up to a couple hundred bucks. Istockphoto.com – While Istock is owned by Getty, this source is much more inline with small business people in mind. Istock operates on a “credit” system–users pre-purchase credits and then exchange those credits for images. Pricing on each image is also expressed in credits. This is annoying but it’s still a great source for inexpensive images with many images costing about $12. Shutterstock.com – Very popular and very cheap. A typical license is just under $15. Shutterstock also operates on a “pre-purchase” system but thankfully doesn’t express fees in “credits” but in actual dollars and cents. The downside is that there is no option to by a single credit, the packages start at two images for $29. Do be aware that credits on many stock sites expire at some point if not used after a period of time. Stock.adobe.com – Adobe is a newcomer on the stock scene but shows a lot of promise. Images range from 99 cents to $10 and image search and acquisition is build right into Adobe program interfaces if you happen to use them. Thinkstockphotos.com – One of the cheapest options, averaging at about $10/image but be aware that pre-purchase of image credits is required and the entry level package is 5 images. Creative Commons is a non-profit organization that allows artists to specify if, and how, they are willing to let others use their images when they upload their creative works online. Not all images are available for commercial use but those that are available are free! Just be sure to check the “use for commercial purposes” checkbox before searching. This resource gives you access to quality public domain images available for any use. Anyone may access the images on their website, and, if you’re an Evermore customer, a Pixabay plugin comes preinstalled on your website allowing you to easily add images directly into your pages and posts. Turning your iPhone or dslr from snaps of the fam to commercial purposes can be a less than stellar idea, but there’s a time and place for this and it can save you plenty of cash. Look to the upcoming installments in my series where I’ll be sharing guidelines on when and where shooting your own pics may be the smart call. I’ll also share some key pointers on how to take your snapshots to the next level. Cameras are everywhere and this has inspired many to learn more and become better than the average shooter. You know a few of these types right? Most do. Why not reach out and see if they’d be willing to help you out? I’ve done this for several of my small business friends over the years and it can be beneficial for all involved. As a small company or nonprofit, It’s usually a good idea to barter offer something in exchange for their work. Do you have something of value to your friend or acquaintance other than money? Are there some key introduction or doors you can open for them? Maybe you make epic furniture or killer artisanal doughnuts? Try offering up a trade! This can be a great approach and happens behind the scenes more than people know. 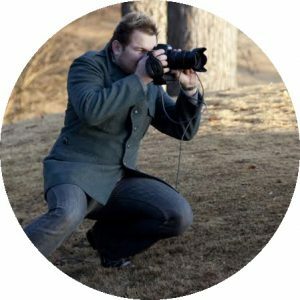 John Fulton is a photographer, director, and digital artist based in Atlanta, Georgia. He is primarily known for his conceptual imagery but works in a wide spectrum of subject matter for clients like AT&T, Honda, Delta, Harley-Davidson, Dupont, Novartis, United Airlines, Aflac, and Anheuser-Busch among others. John’s work has earned him a ranking in the “200 Best Ad Photographers Worldwide” 4 years running. He pens our newest content series: Website Photography Tips for Small Budgets.